Convicted racist, Vicky Momberg, may not have anyone to argue her appeal in the High Court in Johannesburg in March. Her lawyer attempted to abandon the case in the Randburg Magistrates’ Court, but the request was denied by the Court. Magistrate Pravina Ranghoonandan ruled that she could not let him off the case as this fell outside her jurisdiction. It was tense in the court when Momberg opposed Kingdom Onah’s application to drop her case. In open court, Momberg called her lawyer incompetent, a statement which he used to motivate his application. Onah had been representing Momberg free of charge, but it’s clear that their relationship has soured. This is not the first time that Momberg parted ways with her lawyer. Onah also petitioned the High Court in Johannesburg, which is due to hear her appeal against sentence in March. Magistrate Ranghoonandan says it’s up to the High Court to decide whether he be allowed to withdraw. Momberg is expected back in the Randburg Magistrates’ Court the on Thursday. 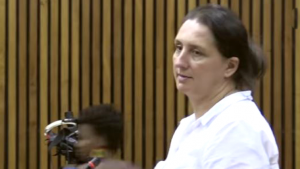 The post Convicted racist Vicky Momberg’s lawyer tries to abandon her case appeared first on SABC News – Breaking news, special reports, world, business, sport coverage of all South African current events. Africa's news leader..